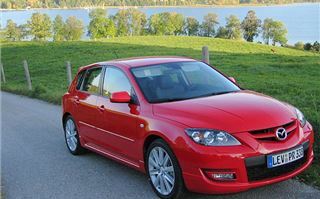 Over the last three years Mazda has made a million Mazda 3s. It’s the company’s best selling model ever. So now’s the time for a high performance version. 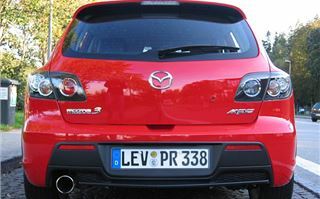 The Mazda 3 MPS. 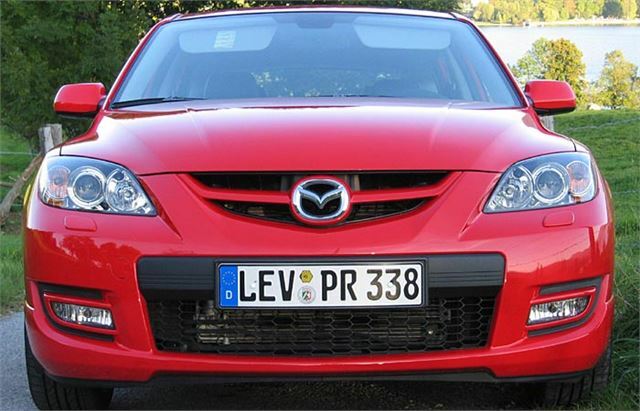 However, the Mazda 3 MPS is not just a warmed over Mazda 3. This hatchback had to be hotter than everyone else’s. 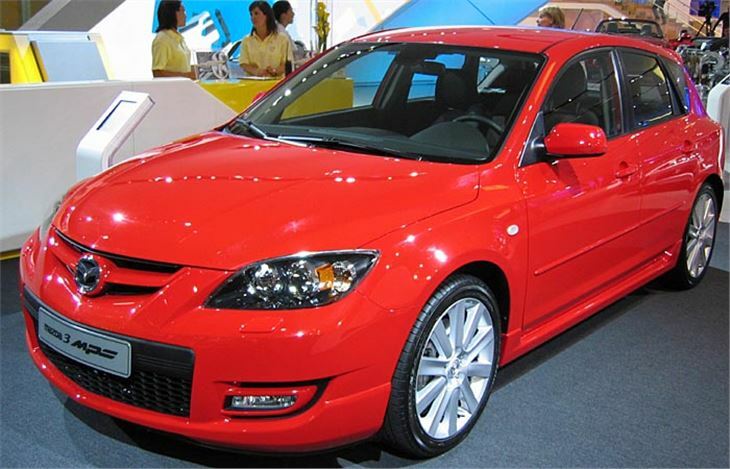 Including the Golf GTI 2.0T, the Leon 2.0T FR, the Focus ST, the Astra VXR, the Alfa 147 GTA and the Megane 225. Under the bonnet you’ll find the same 260PS, 380Nm torque 2.3 chain-cam turbo engine as fitted to the four-wheel drive Mazda 6 MPS. Only the 3 isn’t four-wheel drive. Which, together with its unequal length driveshafts, caused Mazda’s development engineers more than a few headaches in trying to get the power down. This test of three parts begins in Summer 2006. The car has electronic traction control and dynamic stability control, like the Mazda 3 Sport. Unlike the 150PS Sport, it also has a mechanical limited slip differential. But as well as that, in an attempt to get all that power and torque to the tarmac, it also has a steering-angle-sensitive throttle damping system. The idea is that when the steering is turned the system curbs the amount torque steer before the front-end heads for a kerb. This only partially works. Boot it too hard and you do feel the front wheels both searching for grip and finding every tramline in the road surface. Drive it a bit more sensibly, though and it’s fine. This is a very rapid car. It easily gets up to 125mph, then carries on accelerating to about 140 or so. The last 20mph come a bit more slowly and, though it’s limited to 155mph (163 on the clock), there isn’t much more there anyway. It’s stable at those kind of speeds. (Fortunately we had a long stretch of de-restricted autobahn to find out.) However, the question of the relevance of this last-gasp top end in our ludicrously speed limited nanny state is left unanswered. A benefit of the power, of course, is excellent acceleration to get you past slow-moving traffic very rapidly. It’s a fair bit quicker than an unchipped Focus ST. Handling isn’t quite as reassuring, however. There’s no way you can convert a drift in one direction to a drift in the other, as you can, on a track, in the Focus ST (which has basically the same floorpan). 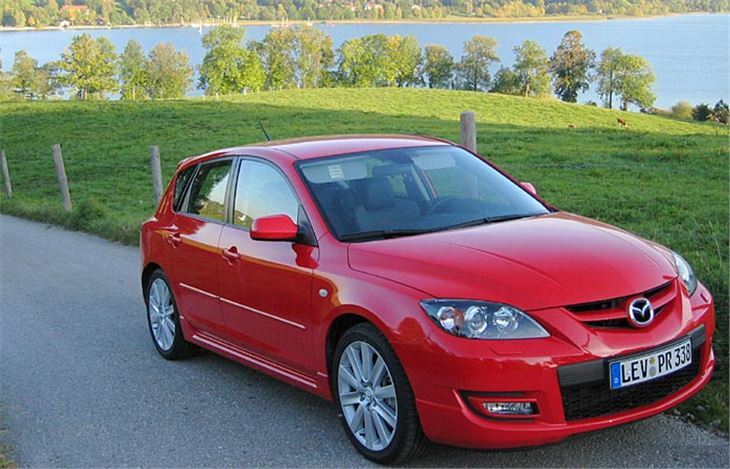 The relatively lighter steering of the Mazda just doesn’t give you the confidence get involved in games like that. It’s a very good looking car. Not overdressed with the standard Euro spec bodykit. The seats are comfortable. The ride quality, even on 215/45 R18Y Bridgestones, is fine. You can specify optional satnav, if your want it. 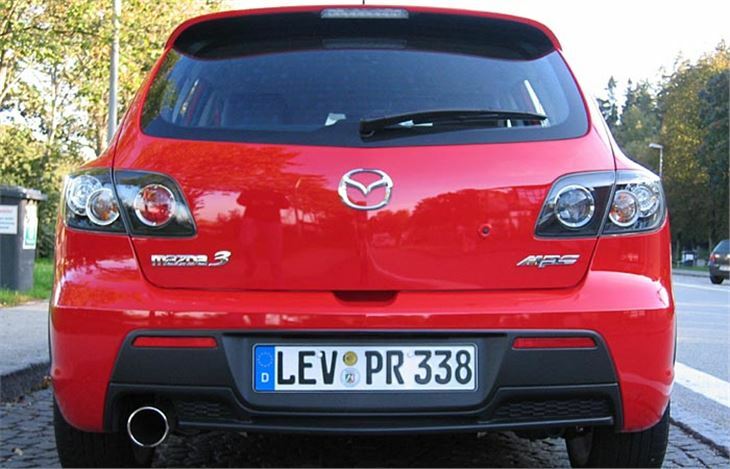 And for Britain Mazda hopes to offer an option of the bigger rear spoiler Japanese versions have, together with slightly dropped suspension and lower side skirts. 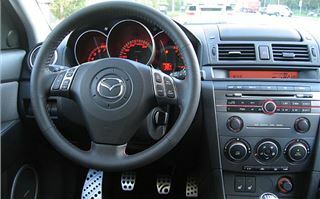 It shares the excellent standard Mazda feature of a knurled knob reclining mechanism for the driver’s seat and a lever for the passenger, so the driver doesn’t find himself suddenly flat on his back while trying to adjust the seat mid-journey, but the passenger can flop down at will. List price will probably be between £19,000 and £20,000, putting the Mazda 3 MPS in the territory of a Golf GTI 2.T, a Leon 240PS Cupra or a Bluefinned high spec Focus ST, but below a Golf R32. But do you want one? Unusually among this class of car you do get a chain-cam engine. You get the highest power output (even more than a Golf R32 and just 5PS less than a £27,000 Audi S3). 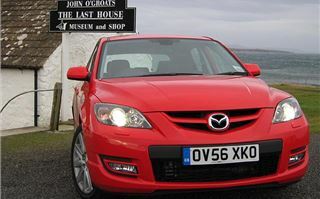 You get Mazda looks and quality. Insurance is a relatively low Group 17. And, take it easy, and you should manage 30 mpg. A different road, a different car? 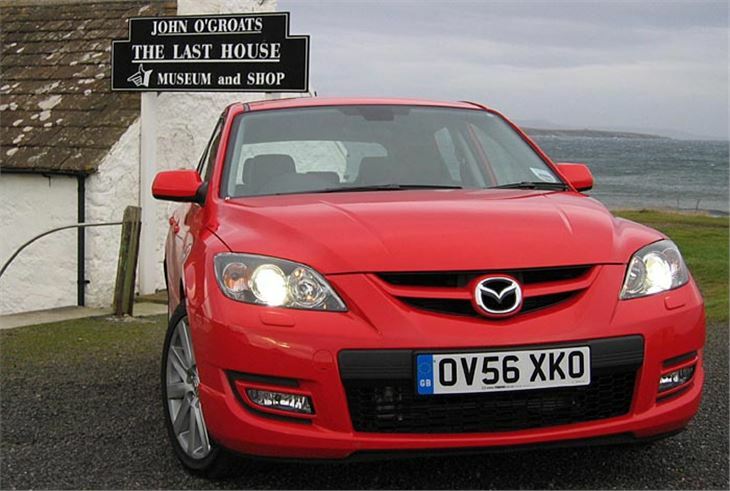 In late November 2006 I got another chance to drive the Mazda 4 MPS, this time with right hand drive and during unusually mild weather in the North of Scotland. If anything could have been a true test of the car’s abilities, this was. Damp surfaces. Straights with sudden undulations. Every kind of twist and turn. And the car was nothing like as unruly as I thought it might have been. You really had to be careful applying the power out of a 3rd gear corner, despite the attentions of the DSC and TCS. But using a bit of common sense the 260PS could not only be contained, it could be used. A slight irritation is that with the headlights on (essential when driving quickly on these roads at this time of year) the backlit instrument lighting dim (thinking it is night) and you can’t quickly see quite how quickly you are going. But basically the car cruises at 100 on twisting A and B roads where normal cars would be pushed to do 80. Yes, you do have to be more aware of the power than in a Focus ST or a Volvo C30 T5. But it isn’t going to fling you off the road unless you do something really stupid. And nothing else actually gives you quite as much power to play with for £18,995. Later still, in April 2007 I, had a chance to track-test this against the standard car at Castle Combe on 10th April. Both cars are much better on the track than some of the other road tests would have you believe and are very easily controlled with just a little bit of torque steer and no bite-back. Quick, too, pulling up to 120mph on the main straight into Quarry. The Sport Aero engine seemed a rev a bit more freely than the standard car. Maybe it just cut through the air better thanks to the improved aerodynamics, and the slightly dropped suspension made a useful improvement to handling. On both cars the (same) brakes were well up to the job, including knocking off 60 miles an hour of speed at Quarry, which says quite a lot. 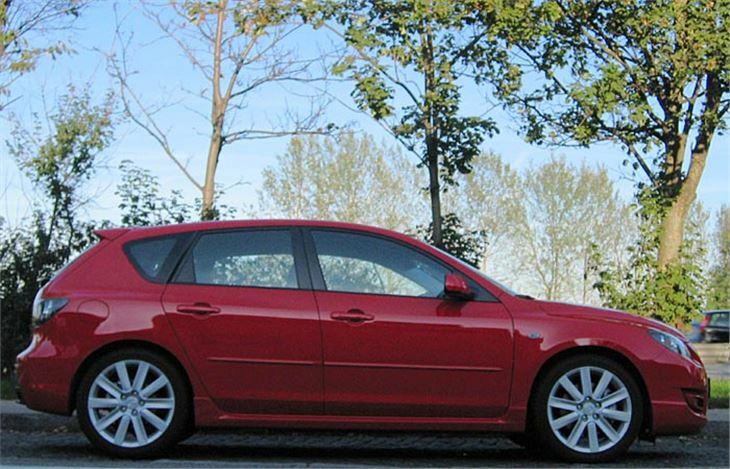 The Sports Aero is well worth the extra £500, but the smaller, more aerodynamic mirrors don't give such a good view. The kit is factory fit only and cannot be retro-fitted.